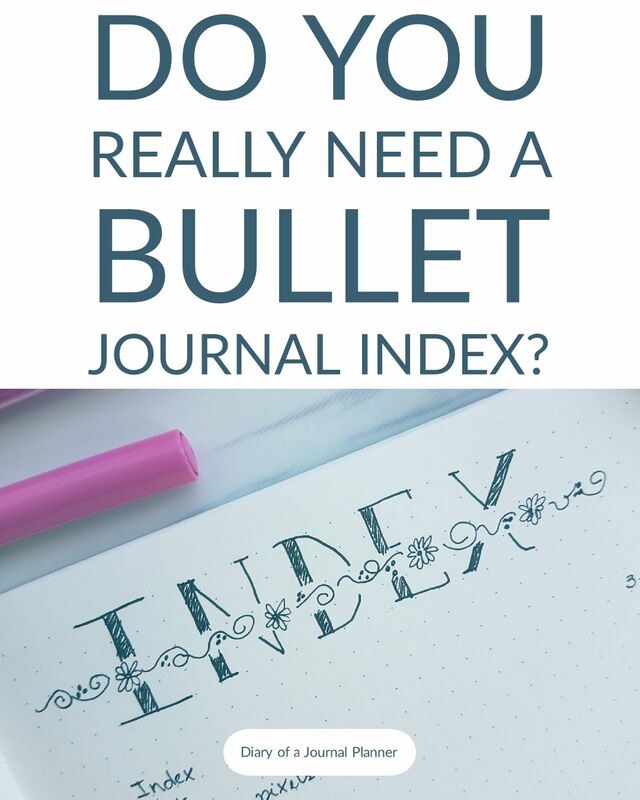 Bullet Journal Index - Do you really need one? 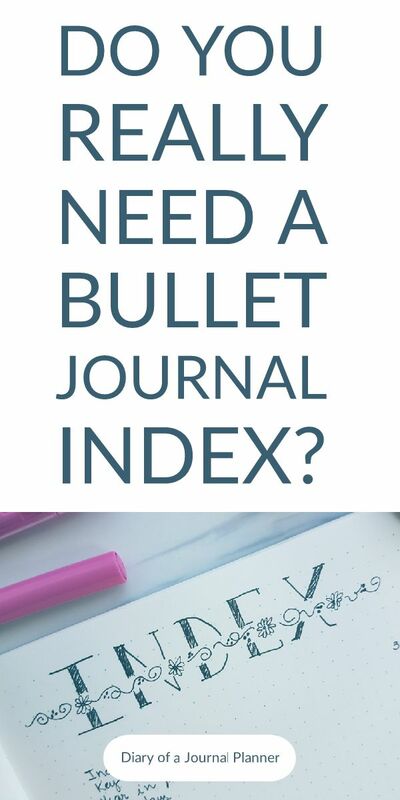 Bullet Journal Index – Do you really need one? Want to make the most of your bullet journal index? 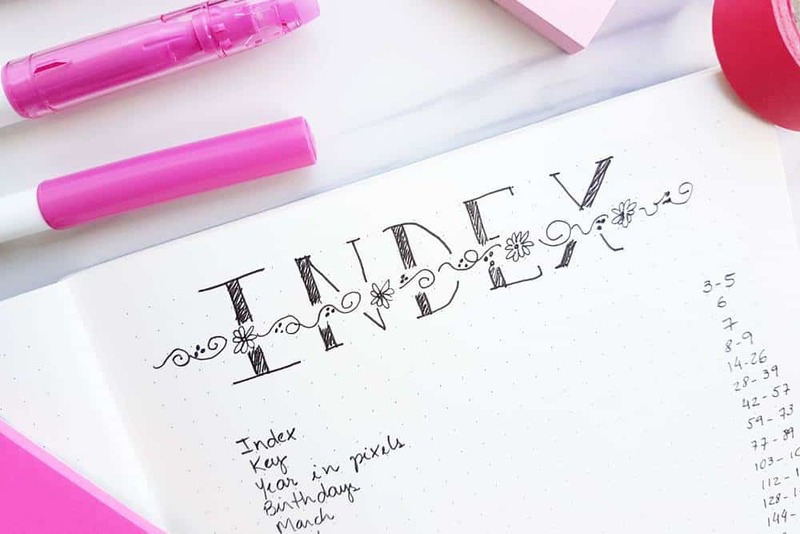 Read this post to learn about the bujo index and how to use it in your journal! Read on to learn my best tips on how to use it and some little hacks that can help you index your content in an effective way. If you are just starting out all these words I am mentioning don’t make much sense to you yet, here are a few articles you might want to check out. 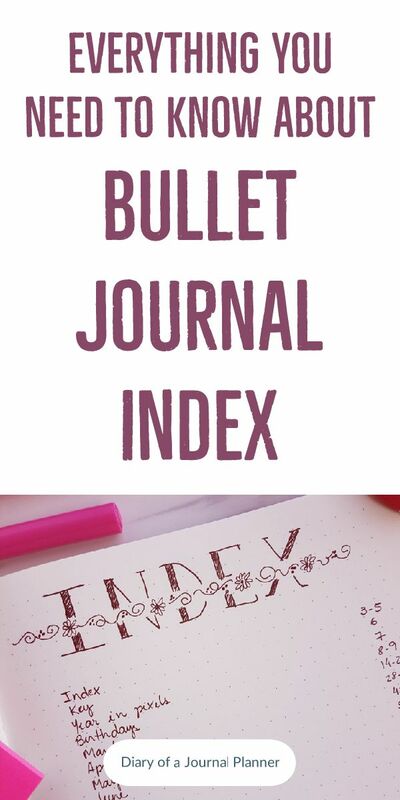 Bullet Journal Index – You are here! What is a bullet journal index? How important is it to have an index in your bullet journal? How many pages to devote to your index? What to do when you run out of index page? What to use in the first page of the book instead of an index? An index is just a list of items and their respective pages. It’s very similar to a list of content only it doesn’t have to be in chronological order necessarily. If you index something in your bullet journal you are just making a list of the collections you have and where you can find them. An index make it a lot easier to search by topic and it’s constantly rolling. So, let’s say you have recurring mood tracker pages every month. In your index you can reference the pages of all your mood trackers at once. Some dot grid journals already come with printed index pages, such as the LT1917, but an index can be added manually to any notebook. This is one of those very subjective sides of bullet journaling. The original bullet journal method from Ryder Carroll presents the index as a permanent feature and one of the first things you set up. 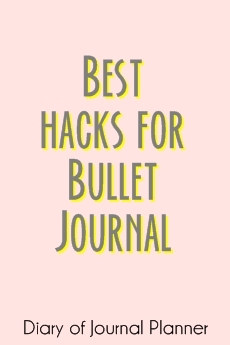 However, depending on your bullet journal style, this might be more or less important for you! So, is it crucial to have an index in your bullet journal? You will find that quite often artsy bullet journalists, such as myself, don’t use an index. That is because their pages are so different from each other mostly and a simple flip through is enough to get you in the page you want to. 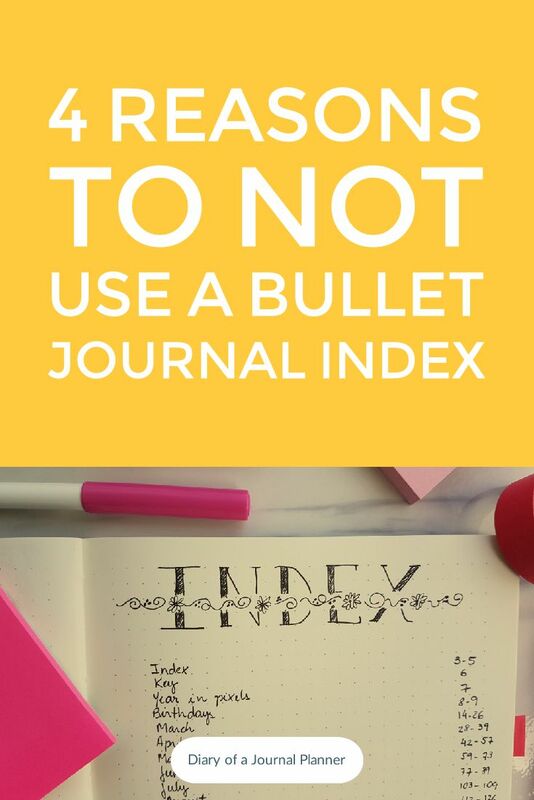 However, there are some great advantages of using an index in your bullet journal. ven though I am quite artistic with my bujo and color code as I go, I have had plenty of “ where is that page?” moments while flicking through my books. Apart from your own preference, using an index can be very helpful depending on how you use your bullet journal. 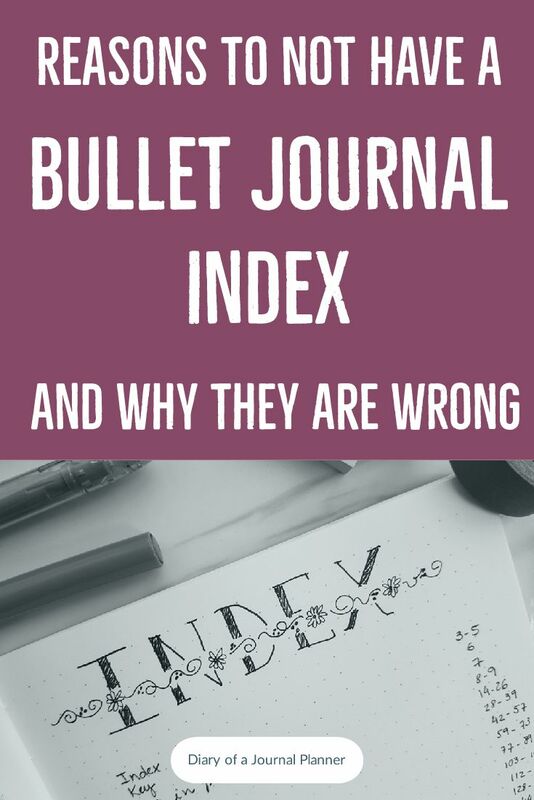 Let’s get the discussion going on and dive into the pros and cons of bullet journal index. 1. When you have a notebook with lots of pages and use many different collections through your entire journal. 2. When you use the bullet journal method only with rapid logging and no artistic graphics to differentiate pages: you will notice over time that most pages will look pretty similar and find an specific page flipping through 120 similar looking pages can be very time consuming. 3. When you have family trackers: When you have other people’s tracker on your journal (such as family trackers) so everyone can find and edit an entry easily – for instance homework checklist or family chores. 4. When your bullet journal is sectioned off randomly as you go and your collections end up placed within planning pages. 5. When you want to find one-off pages from old journal books. When you are actively using a notebook you probably know pretty much where most pages are but it will take a lot of flicking through old journal to find specific pages. it is much easier to reference them as indexes help when you wish to carry over info between old and new journals. 1. When you use thin notebooks: if you use notebook with fewer pages (i.e. 50 pages) an index might be redundant. 2. 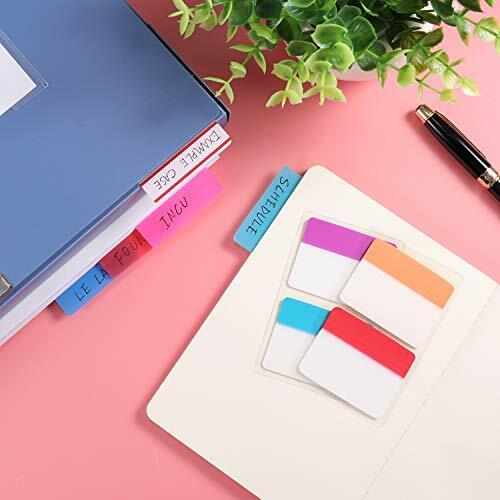 When you color code your pages: if you use washi tape on the edge of the pages, magnetic page markers or tabs or use disc bound dashboards you may not need an index. 3. When your pages look totally different: if your monthly spreads always have different themes you can easily flip through your journal and find pages quickly without an index. 4. When you enjoy flipping through your journal pages: Yeap, it is a real thing! Many people actually love going through their pages again and again, specially when they use their bujos also as a creative outlet. And even when they do have an index they don’t use it. If you decide to use the index, there are a few things to consider before you setting up your bullet journal notebook index page. Are you going to index numerically (in page order) or by category of items? Are you going to set up the index in the front or in the back of the book? If you use a index notebook such as the Leuchtturm which has numbered pages you just need to go indexing pages as you create them. Otherwise you might need to add number to your pages (can also be done as you go). This way is just basically filling up the index every single page or group of pages as you go creating and using it. The advantage is that you will have a super organized and comprehensive index where you will be able to find anything. The disadvantage is that it is more time consuming to find your pages, as you have everything indexed. And, you can run out of index pages pretty fast (more about this below). If you use the LT1917 then you have 3 premade index pages with page sections as description for index all printed out for you. 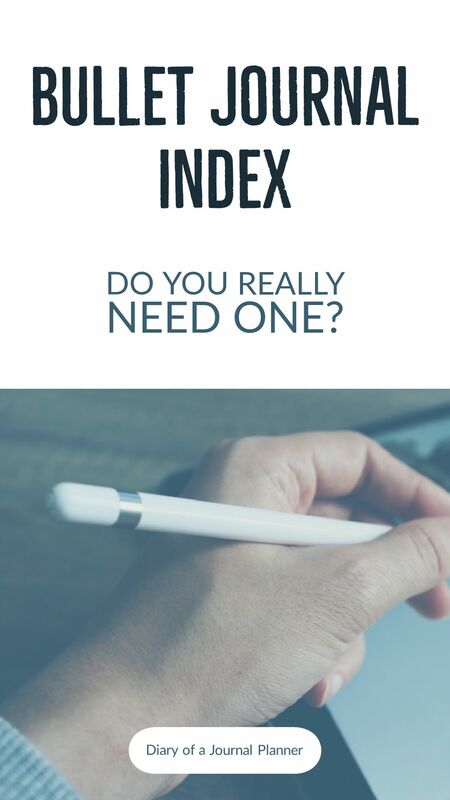 I don’t particularly like this format because I prefer describing what I am indexing first then adding the number, but it does make easy for your to index numerically. If you like to use this system I just recommend leaving the next couple of pages after the index blank as if you run out of pages you can carry on from there. This is the way that I do it and make sense for most people. Many people don’t index weekly and dailies and only list collections on the index. Normally you need to find where a specific spread/page that you will revisit often is and not regular journal entries. You can still add the month to the index so you will find all those particular calendar pages within that space by writing the page numbers relating to one month on one line. What you can further do with this style of indexing is splitting it by having one index page for calendars (the calendex) where you list your monthlies, weeklies and dailies, and another for collections. Although the normal seems to be to place the index in the front of the page, and some books have them already set up in the front, some people find success in setting their index from the end of the book. That is actually where indexes normally go in books. Indexing from the back of the book means that the last page of the book is the first page of your index and you carry on from there backwards. The obvious advantage is that you will never run out of pages! You can index as much or as little as you wish. Many people also wonder, when not using the printed index of notebook, how many pages to leave blank for indexing. Using this technique will avoid any misjudging, specially when you are starting out and have no idea what a full book will look like. The bullet journal L1917 comes with 3 pages, and it is normally plenty if you use threading. I have seen other notebooks with 4 printed index pages. But I have seen people using anything from 2 to 12 index pages! So it is definitely hard to gauge how many your will need. I suggest leaving 4 for your first bujo, eventually you will know how many pages you need. 1. Add an extra index in the middle of the notebook: You can have more than one indexes even though it will make the process a little bit harder. Just split the list: what you have covered so far in the first index, now start a new index for you to add the items from now on. 2. 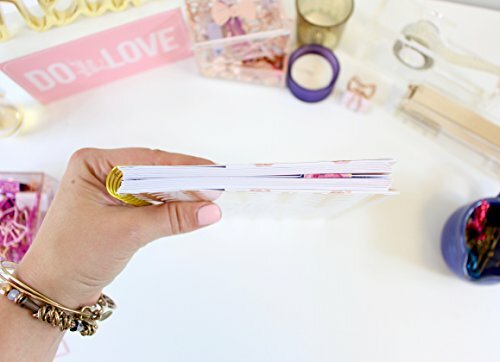 Tape another page on the back of your index: Just pick a blank page and put it in place with washi tape or paper clip. 3. Add new pages if you use a disc bound notebook: the beauty of disc bound bujos is the page flexinility. 4. Start at the back if the notebook: and never run out of index pages again! 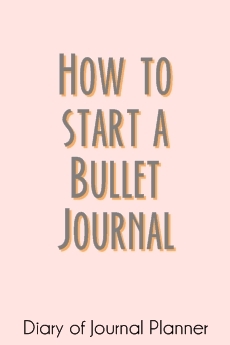 A bullet journal index is one of the easiest pages to set up. Of course you can embellish it like any other page but this is a spread that I keep clean for the most part – because I want it to work and not distract me from finding the pages. There are many bullet journal index ideas around pinterest if you want to see but I keep it simple. The most artsy I go with this page is adding a flourish header and the rest is plain straight lines and dots. Separate your page in 2 columns, one for the content description and a smaller one for the page numbers. 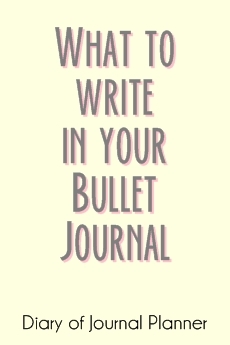 Fill as you create the content in your bullet journal. And that is it! I think it is clear by now that bujo indexing is not one size fits all kinda thing. Washi tape can do just as good job bookmarking as tabs. Washi tab important pages that you use often on the edge of the paper such as budget tracking. This works really well if you don’t have a large amount of things to look back to. These lovely stickers do a great job bookmarking your month layouts. Perfect for when you don’t have many collections to search for and just need to easily open your monthly pages. Easily divide your main sections with these tabs. 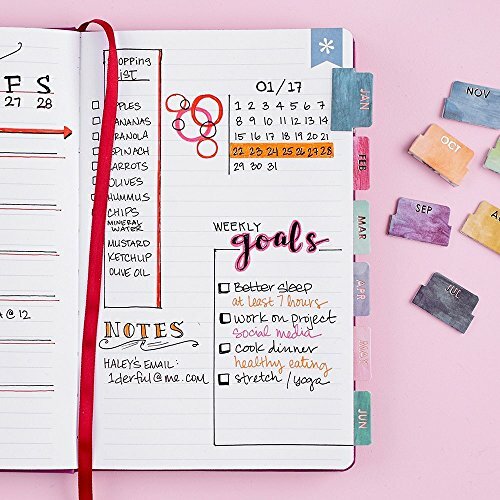 For filofax or discbound bullet journals dividers can work super well too because you can shift pages elsewhere, so you could have a divider just for some of your collections, and for monthly pages. These cute markers can be used as well, just like the washi tape color coding technique. You will find that mostly you will have to flick through to find the pages you want but at least it will help you sort through types of content. You can of course use a mix of all the above and come up with different bullet journal index ideas. You can still use tabs and index! For instance index all of your collections (recipes, picking lists, journaling lists, event memory pages, etc.) and use a tab for frequently visited pages for planning (future log, monthly, weekly and dailies). You can use a flip out page to find pages of a given content. Your flip out paper features all the categories that you have indexed. Then you color the edge of the page in the same height to match that category. With a simple look you can see where the content is, like in the image below. So, what if I don’t need to use an index, what should I do with those index pages if my book already comes with it printed? So tell me, how do you use your index?